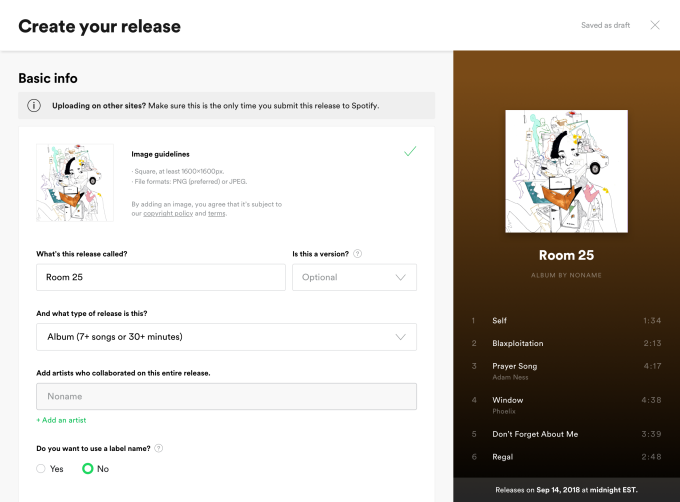 Spotify has begun opening uploading not just to labels and distributors, but individual artists. And the implications of that could be massive, if the service is expanded – or if rivals follow suit. On reflection, it’s surprising this didn’t happen sooner. Among major streaming players, currently only SoundCloud lets individual artists upload music directly. Everyone else requires intermediaries, whether that’s labels or distributors. The absurdity of this system is that services like TuneCore have profited off streaming growth. In theory, that might have meant that music selections were more “curated” and less junk showed up online. In reality, though, massive amounts of music get dumped on all the streaming services, funneling money from artists and labels into the coffers of third-party services. That arrangement surely makes no sense for the likes of Spotify, Apple, Google, and others as they look to maximize revenue. You’ll upload via a new Web-based upload tool. Check the tool and FAQ. It’s invite-only for now. A “small group of artists” has access for testing and feedback, Spotify says. It won’t cost anything, and access to releases will be streamlined. No fees, the full commission – the deal is better financially. And you’ll be able to edit releases and delete music, which can be a draconian process now through distributors. Regions are a big question. The tax section currently refers to the W9 – a tax form in use in the USA. So clearly the initial test is US-only; we’ll see what the plans are for other regions. The question really is how far they’ll expand, and how quickly. If they use all of Spotify for Artists, as their blog news item would seem to imply, then some 200,000 or so verified artist accounts will get the feature. (I’m one of those accounts.) 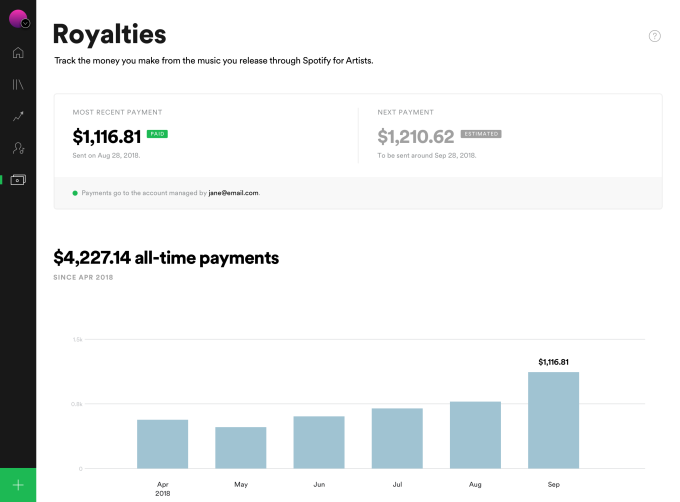 200,000 artists with direct access to Spotify could change the game for everyone. Even the word “distributor” barely makes sense in the current digital context. Unlike a big stack of vinyl, nothing is actually really getting distributed. More complete management and monetization platforms actually do make sense – plus tools to deal with the morass of social media. Paying a toll to a complicated website to upload music for you? That defies reason. Just keep in mind: Spotify for Artists was 200,000 users at the beginning of summer. At least as of 2014, SoundCloud was creating 10 million creators. So it’s not so much SoundCloud losing as it is another sign that SoundCloud won’t really take on Spotify – just as Spotify (even with this functionality) really doesn’t even attempt to take on SoundCloud. They’re different animals, and it’s frustrating that SoundCloud hasn’t done more to focus on that difference. But all this still remains to be seen in action – it’s just a beta. Just remember how this played out the first time. Spotify reached a critical mass of streaming, and Apple followed. 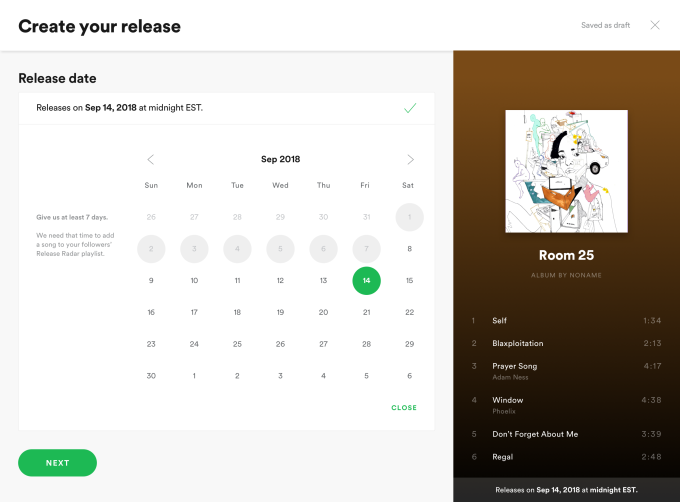 If Spotify really are doing uploads, it’d make sense for Apple to do the same. After all, Apple makes the hardware (MacBook Pro, iPad) and software (GarageBand, Logic Pro X) a lot of musicians are using. And they tempted to capitalize on their strong relationships with artists once, with the poorly designed Connect features (touted by Trent Reznor, no less). They just lag Spotify in this area – with the beta Apple Music for Artists and Apple Music Toolbox. But does this make sense? It sure does for the streaming service. Giving the actual content makers the tools to upload and control tags and other data should actually reduce labor costs for streaming services, entice more of the people making music, and build catalogs. And what about you as a music maker? Uh, well… strap in, and we find out.